When I first started in marketing I was one of a three-person marketing team. Customers shouldn’t be able to tell different parts of your launch were put together by different teams. Back in those days, taking a new feature or product to market was more or less a solo effort. 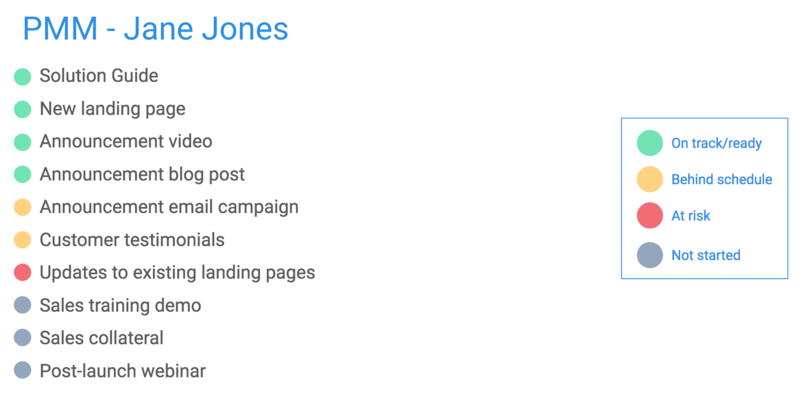 I’d do everything from defining the positioning to writing every landing page, tweet, ad and email, as well as hosting webinars and creating videos and other visual assets. This is standard experience for anyone at an early startup but as your company grows, product launches become a whole different beast. Your marketing team starts to introduce more specialised roles – demand generation managers, content marketers, PR managers and so on. This is great! A team of experts means better work all round, as each specialism brings their expertise to support your launch efforts. Whilst this expertise means your team can solve more specific problems, it also introduces the danger of an incoherent experience for your customers. It can lead to silos within your team that threaten to make your launch a jumble of disparate pieces that make little sense to your customers and prospects. Inconsistent messaging and a disjointed experience can quickly lead to confusion (“Wait, what is it you’ve launched?”) or even suspicion (“It doesn’t seem like you know the benefits of your product, so why should I care?”). Either of those scenarios very quickly leads to prospects giving up. For a successful launch your team needs to work as one. Your customers shouldn’t be able to tell that different parts of your launch were put together by different teams. So how do you ensure every touchpoint, whether it’s an ad, an email, a video or a tweet, is reiterating the same benefits, same differentiators and same key messages? The answer: co-ordination and communication. For a launch, everyone across your go-to-market team should be on the same page in terms of your goals, messaging and timing. And as product marketer, it’s your job to ensure they are. I’m sharing some of the simple processes and tools we used to keep our teams in sync and ensure consistent messaging across our marketing efforts. They’re by no means perfect or set in stone. They are living, evolving processes that will continue to adapt and change as we grow and learn. But hopefully they provide some inspiration and help to my fellow product marketers in growing marketing teams. We recently shared our “build-a-box” process about how we work with the product team. It’s a positioning exercise that involves product marketers, product managers and designers imagining our product is in a physical box on a shelf, and coming up with the messaging we would use on that box. This is discussed and refined until we have a final messaging that is then used as the cornerstone for all our marketing efforts. We still use this exercise, but recently we’ve added “solution guides” as a new output from this work. These are internal guides that can be used by anyone in our company, be it marketers, sales or engineers, to quickly understand how we position each product offering. It’s a living document that should be accessible and understandable to everyone in the company. The guide captures the positioning, as well as additional information about target audience, common search terms and competitive intelligence. During a launch, this helps all your teams stay aligned on messaging and helps marketers optimize outreach activities. Beyond the launch, it acts as the go-to resource for new and existing teammates to understand how we position and describe a solution, and is updated to reflect any changes in positioning or the market over time. 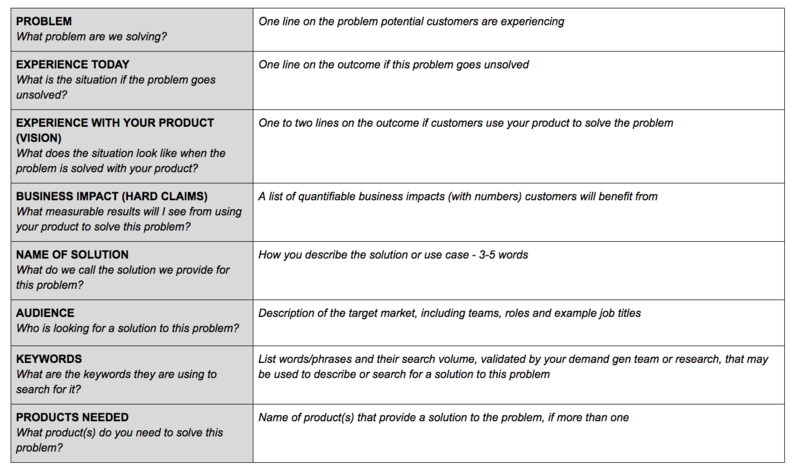 Here’s a template to try it out for your own solution or product. I’m a firm believer that regular, transparent communication comes above all else when it comes to successful cross-functional collaboration. To facilitate that within our go-to-market (GTM) teams, we hold weekly GTM stakeholder syncs throughout big product launches. The first session typically acts as a kickoff, where each team explains what they’re doing for the launch and timelines are shared. After that, each weekly sync is short – typically 15-20 minutes – and involves the key stakeholders from each team involved in the launch, with one or two representatives from sales, support, account management, and each area of marketing (demand gen, PR, content, etc), as well as representatives from product such as the PM and/or a program manager. During the sync we also provide any updates from product or GTM that could impact the launch, as well as “spotlight” slots where one team covers what they’re working on in a little more detail. The syncs help each team understand what others are working on, where there might be overlap or opportunities for collaboration and discuss potential blockers or risks. As a product marketing manager, they help you ensure everyone is on track with both timing and messaging, and allow you to spot and raise any risks to the launch as soon as possible. For updates in between stakeholder syncs, we also have a GTM Slack channel for updates, useful links and questions for the group, as well as quick check-ins on progress. With a growing sales and support team, it’s essential to properly prepare everyone so they’re ready to sell and support our new features or product. In the past we’ve done a live “townhall” for sales and support, covering both a product demo and information on pitching and positioning. But as we’ve grown, we’ve found these sessions hard to scale. With staff in Europe, North America and APAC, scheduling was becoming a logistical nightmare and the information sales and support need are slightly different. Support want more technical feature information, whereas sales are more focused on competitive and positioning information. An enablement doc with feature info, positioning, pricing details and FAQs. A live product demo by the PM covering each new feature in detail, the use case, and showing it in action. This was recorded for those who couldn’t attend live. A recorded sales training video covering positioning, our target audience, competitive comparisons, how to pitch and customer stories. This was coupled with a written task that reps had to complete to demonstrate their understanding of the offering. 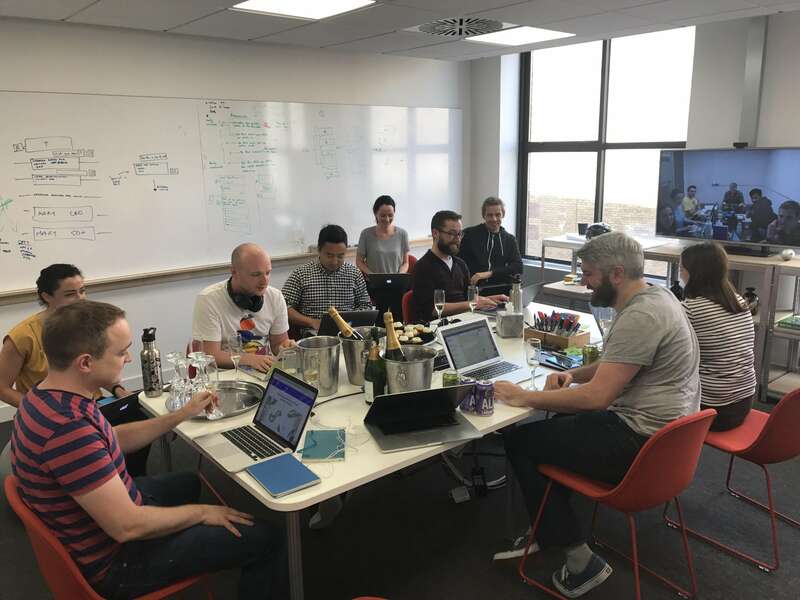 When you’ve got everything in place and are counting down to launch day, it’s important that everyone, from the PMs and engineers to support and marketing, knows what is happening so that everything rolls out smoothly come launch day. You don’t want to ruin all that hard work on consistent messaging with a premature tweet or an email campaign going out before the landing page is live. This is where the plan of attack comes in. Agreed in the week leading up to launch, this is a doc detailing all the steps needed to roll out the launch, when they should happen and who owns making sure they get done. We break down every step – when features go live, QA, campaigns, social, content, ads and so on – with specific times. You can get a template here. On launch day, all the stakeholders attend the “war room” (one in each office, connected over video call) and make their way through the plan of attack, crossing off steps as they’re completed. Updates, blockers or important notes are discussed in person in the room and noted in the GTM Slack channel (which now becomes the launch channel). This way, everyone is aligned and you can ensure everything is complete. And then you can all celebrate with champagne together. ? Of course, a launch is just the beginning and there’s plenty more to do from this point, but it’s always good to take a moment to celebrate your achievement. It’s also a good idea to hold retrospectives after the launch so you can learn what worked and what could be improved across the teams so you can keep evolving your processes.